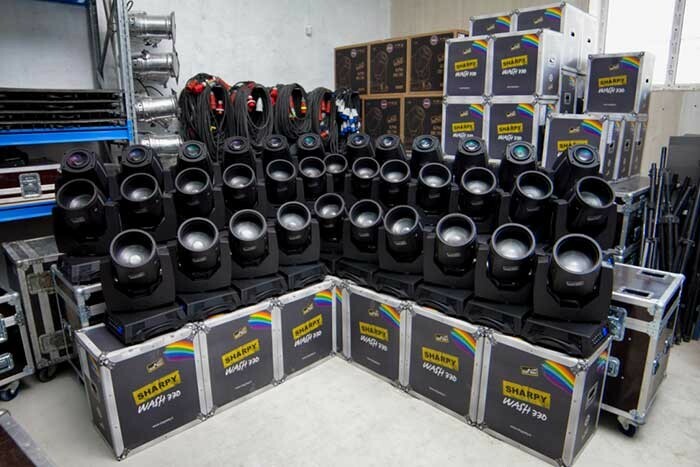 Russia – Elkruff , the Novosibirsk-based lighting rentals company and one of the biggest in the Urals region, has chosen to invest in 24 of Clay Paky’s compact yet extraordinarily bright Sharpy Wash 330s and 12 Alpha Spot QWO 800 STs. The Russian production company’s key market is to develop and deliver integrated creative and technical solutions for events of all sizes. For Elkruff this meant it was looking for robust, fast, compact feature rich fixtures that would offer its diverse client base the most value for its investment. "Elkruff chose to buy Clay Paky equipment because the company’s mission is to stock the latest, most up to date technology," explains Slawa Gartung, Clay Paky sales manager for the region. "In particular the company wanted fast moving fixtures that would offer a wide spectrum of effects, not generally available together in other products. This made the Alpha Spot QWO 800 ST and the Sharpy Wash ideal choices. In addition both are compact, lightweight and inexpensive to maintain." "The Alpha Spot QWO 800 ST Version is ideal for studio use (Television and Theatre)," continues Aleksey Bulgakov, chief technical officer of Elkruff. "We really like the fact that the optics system has undergone a special processing, which lowers the color temperature of the output beam of light. Additionally, the fixture is equipped with optical features that place it at the very top of its class, including a super-wide zoom range from 7.6° to 55°, a uniform beam distribution at all zoom angles and a unique Stay-Sharp-Zoom feature that locks images in focus, even while zooming. All this makes the Alpha Spot QWO 800ST a hugely appealing proposition for our clients." In Russia, increasingly Clay Paky is becoming known for being the leaders in the world entertainment lighting market and Aleksey Bulgakov says this has influenced his buying choice. 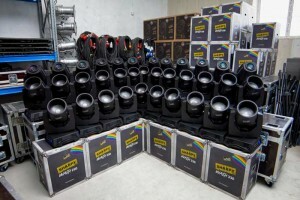 "I have found all Clay Paky’s products to be robust and reliable. Moreover we find an overwhelming majority of professional lighting designers are using Clay Paky equipment. This makes us delighted to announce that Elkruff is practically the first in this region to buy this new equipment and that we have found it to be of so much better quality." "In addition to the Alpha Spot QWO 800 ST Elkruff invested in the Sharpy Wash 330- an extraordinarily compact, lightweight 330W washlight which offers the luminous efficiency, graphic and optical performance of a 1000W fixture," adds Slawa Gartung. "The fixture is silent and very fast. Fitted with a complete CMY color system, special colors, 6.5°-48° zoom, mechanical dimmer, beam shaping filter and motorized top-hat, it’s an energy efficient fixture that facilitates considerable savings when it comes to running and power consumption costs." Aleksey Bulgakov of Elkruff is delighted: "When we decided to invest in new stock we studied the market intensely. The reason we elected to invest in Clay Paky was the quality of the products. However it was also the fact that the company was more flexible and its people were ready to listen and help by giving us detailed consultation. The company representatives are always online and ready to communicate, for these reasons and the outstanding quality of their products we very much look forward to a bright future for our business."